I haven't been doing much "fake baking" lately; when I started doing that, I found myself eating a lot of bakery type stuff in place of more nutritious things like eggs or vegetables or nuts, so I laid off the baking for awhile. Today was a special occasion, though: I was invited to a tea party! I knew there would be frosted cupcakes of the sugary, carby kind so I offered to bring an alternative. I made a reaaaaally small batch so there won't be many leftovers, but whatever is left will get frozen. These turned out nice! 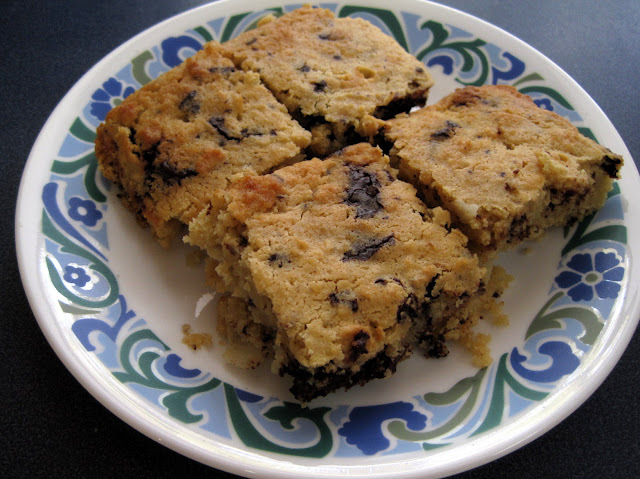 The texture is much like a regular cookie bar, and the flavor is good. They're grain free, gluten free, and almost sugar free (the chocolate has a small amount of sugar which comes to under a gram per bar). I'd say these are good 'special occasion' cookies and might be nice for Christmas, if you like to bake. Usually I link to the site where I found a recipe, but I cannot for the life of me remember where I got this. I wrote it down some weeks ago and tweaked it and cut the recipe down to make only 8 small bars. Mix the flours, coconut, and baking powder in a bowl. Mix everything else except the chocolate in another bowl. Add the dry stuff to the wet stuff and stir until combined. Stir in the chocolate. Spread in a regular sized bread loaf pan (greased or sprayed with Pam) and bake at 350 degrees for 18-25 minutes, or until they look done and the edges are starting to brown. Let them cool completely and cut into 8 bars. I love chocolate and coconut. It reminds me of a Hello Dolly bar. I will try making these at Christmas for my husband who is also eating low carb. Thank you! Sounds yummy. I'll have to give those a try. This week I plan to make cauliflower pizza and 65MD has agreed to try it. Before when I made it I was the only one that ate it. Now he's trying to eat in a more healthy way so he's game to give it a try. I'll probably blog about it. I have found when I am on track and losing weight, making any kind of "cookie, cake, brownie..." type thing, regardless of the "healthy" ingredients keeps me on the track of wanting to eat crap. It keeps my food addiction hanging - right there in front of me. When I start making "healthy option" junk food, It becomes obsessive. I consume too much of it. It's hard on me mentally and physically. Just my personal experience. If you find it hard to stay on track, or finding the weight is not coming off like you think it should be, maybe experimenting with baked goods should be put on hold. This is only my 2 cents. I have 2 left and they are saved in the freezer. I am thinking they may come in handy for other holiday parties between now and Christmas. I was having horrible cravings tonight (stress surrounding elections, we have several local candidates we're working with and one is in a very tight race tomorrow!) and decided I needed a substitute dessert so I didn't cave an eat carbs. So I had some macadamia nuts, original Almond Breeze (unsweetened) with some SF vanilla torani, and a cookie bar. The damage was close to 500 calories and slightly over my desired carb count (still within range of my max, though!) and way better than if I hadn't done a plan-appropriate 'binge'. Not what I wanted tonight, but not the end of the world, either.